Our final Christmas celebration was this past weekend. After spending Christmas Eve and Day in Oklahoma with our youngest son and his family, and our oldest son who flew in from Florida for the holidays, we returned home the day after Christmas for a couple of days accompanied by our oldest son. The husband had to work Thursday and Friday, so I did laundry, repacked some clothes, and loaded up the last batch of Christmas gifts and food for the trip to St. Louis on the 28th. That Friday evening we got together with my side of the family (my parents and two sisters, their families, nieces, nephews, and all the great-nieces). Also joining us that evening were all of my cousins (who are like brothers and sisters to my sisters and I) and their spouses and families if they were able to make the trip. Each year one or two cousins can’t make the trip, and we miss them so much. As you can tell we have quite a large group Friday evening. At first we just visit and eat, then visit and eat some more. …will play with the littler kids. Later in the evening, those who want to participate, brought an ornament, and we play that “Stealing Santa” game as an ornament exchange. Some ornaments never get “stolen” and some ornaments are very popular and get stolen with great regularity. We always have a blast with all the different styles of ornaments! Believe it or not, he is holding an ornament of an angel that is actually is quite pretty. We all do some pretty silly things at our Christmas get-togethers! Then my husband “stole” the angel!! One of our family traditions is playing Bingo at our Friday night gathering. The adults bring a variety of “White Elephant” gifts as prizes for those lucky enough to “BINGO!” (see previous post titled “I’m Dreaming of a White Elephant — Ummm CHRISTMAS!” if you don’t know what a white elephant gift is). It’s always a lot of fun because our Bingo Caller “Pro” is SO funny!! And all the kids (old and young) enjoy the fun. Even the littlest ones take Bingo seriously. We look pretty intense here, studying our Bingo cards, don’t we? Now, I’m really not sure what Josh is doing…but it looks like he is praying over his Bingo card! The twins, Abi and Emma, and Jade are taking a little break while everyone resets their Bingo cards and the caller prepares for the next game. Saturday morning we have our traditional Christmas breakfast then exchange gifts with our parents and the smaller children. That’s the photo calendar of all our birthdays and anniversarys that I made my parents on Shutterfly. I also made them a photo album. Oh, my! That’s my dad and his crazy, dancing Santa hat! Several people had to take turns wearing it. Hmmm….I guess we had more than one Santa hat! When the little ones start opening gifts, it becomes quite chaotic! Years ago my sisters and I and our spouses decided we would stop exchanging gifts. We all have been VERY blessed through the years. Instead we take the money we would have spent on one another and put it together (and my parents also contribute). My sisters and I all live in different towns/cities, so we take turns finding a needy family to buy gifts for or a worthy organization to donate the money to. Over the years we have helped single parents, parents with extreme health problems, Operation Food Search, flood victims, the Joplin tornado victims, families with very sick children, and families just going through some financially tough times. We have all agreed numerous times, that our Christmases have become more meaningful as a result. As my parents got older and our family expanded, shopping for such a large group became quite a burden for them. They decided to give us and their grandchildren and older great-grandchildren cash instead of gifts. They REQUIRED ONE thing from us: We HAD to go shopping that Saturday and spend the money! After supper that night, we gathered together and would all bring our “gifts” so we could show my parents (and each other) what they got us for Christmas. Since it is usually after Christmas when we get together, we always see who can get the most/best bargains for our money! This year we started “The Showing of the Gifts” with the youngest going to the oldest. OH! The silly things Papas and daddys will do for their grandchildren/children! Here we are with our two sons, daughter-in-love, and three grandchildren. My! My! God has truly blessed us! We have had three wonderful, chaotic Christmases this year (as we do most years!). As the years go by, I have learned to try to savor every single chaotic moment. I certainly hope you have enjoyed this holiday season with your family and friends. I also hope and pray that you celebrated the true reason for the season: the birth of our Lord and Savior, Jesus Christ, who came to earth to pay the debt for our sins so we could enjoy eternal life with Him in heaven! May God bless you throughout the coming new year! Christmas traditions are as varied as each individual family. Our traditions always include traveling, family visits, great fun with gift exchanges, and lots of good food. What traditions do you have? 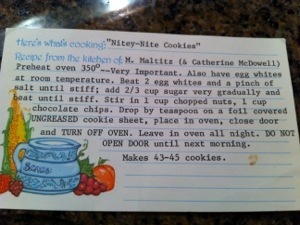 I am “famous” (at least among my family members) for my Nightie Nite cookies. I would make these sweet little treats every Christmas, and thus began my tradition. Before I knew it, my cookies became the most sought after and requested treat each year. I thought I would share that recipe with you today. Here is what you will need (full recipe is below). First you will need to separate two egg whites from the yolks. THE EGGS ABSOLUTELY MUST BE AT ROOM TEMPERATURE!!!! Also, ONLY use a glass bowl and metal spoons. DO NOT USE ANY PLASTIC BOWLS OR UTENSILS!! Plastic retains small amounts of oils from other foods you have prepared with those utensils and that adversely effects the Nightie Nite cookies. Note: I have used this SAME bowl for over 30 years! Add a pinch of salt. I literally put some salt in my hand and pinch some between my thumb and forefinger. Now beat the egg whites and salt on high until it forms stiff peaks. 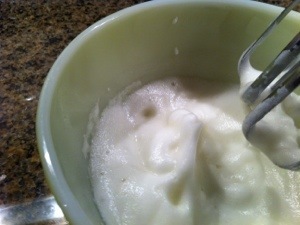 Beating the egg whites until they are stiff takes a couple of minutes. 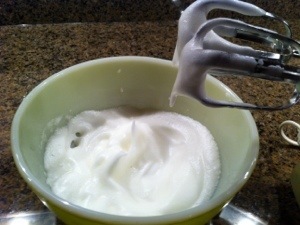 The egg whites should form stiff peaks like this. Now this is the part that takes the MOST patience. You MUST add the two-thirds cup of white sugar VERY gradually. I usually pour a little bit (about 2-3 tablespoons) in and beat until I see that the granules have “dissolved” and then I add a little more. I continue doing this until I have added all of the sugar. The mixture gets VERY stiff by the time you have added all the sugar. 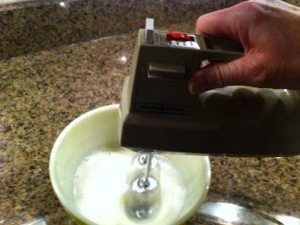 Because it gets SO stiff, my little hand mixer seems to strain and slow down even though it is still on high. One of these days my trusty ‘ole mixer will give out. I just hope it’s not in the middle of a batch of Nightie Nites! After gradually adding all the sugar, the mixture looks like this. Now I add the semi-sweet chocolate chips. When I started making these cookies, I used regular-sized chocolate chips. The last couple of years I have used the miniature sized chips, and I think I like them better. Fold in the chips until they are dispersed throughout. Cover a cookie sheet with foil — this is important! You don’t want the cookies to stick — and they WILL stick! I have never used parchment paper with these cookies because I never wanted to risk the cookies not coming out right, so I don’t know if parchment paper will work. If you try parchment paper, please let me know if it works. Now drop a teaspoonful of the mixture onto the foiled-lined cookie sheet. Space them out a little. They don’t really “spread out” like sugar or chocolate chip cookies do, so you can put them a little closer together. I just LOVE it when they make little points on the top! Next I sprinkle red and green sugar on top to make them more “festive” for the Christmas holidays. Now place them in the oven which has been preheated to 350 degrees. Turn the oven OFF and leave the cookies in the oven until morning. When my children were small, we would tell the cookies “Nightie-Nite” after putting them in the oven, and off to bed we would go!! I always put a note on my oven door to remind my kids (AND MY HUSBAND!) to NOT open the oven until morning. In the morning, open the oven, take the cookies out, and place them in your favorite holiday container. I like to line my containers with foil also. There’s no particular reason to do this, I just like to do it. I alternate between the red and green to make it look prettier in the container. These cookies are very light-weight and crunchy. I prefer a smaller size so I can POP the whole thing in my mouth in one bite. I have made them larger before, and they are just as good. Also, I can never tell exactly how many cookies each batch will make. Some times the batch will totally fill my container and more, and sometimes it barely fills the container. It might have something to do with egg size, weather, altitude…who knows. I only know that I, along with all my family, just love these little cookies! Since things will get very hectic around here from now until after New Year’s Eve, I’m not sure if I’ll post again until after the holidays. I hope you have a very Merry Christmas! May God bless you in 2013!! 2 egg whites AT ROOM TEMPERATURE, a pinch of salt, 2/3 cup white sugar, 1 cup chocolate chips (I use half of a 12 oz. bag of the mini chips), 1 cup chopped nuts (optional – I have never put the nuts in my cookies, but I’m sure they would be good), and a foil covered, ungreased cookie sheet. Beat 2 egg whites and a pinch of salt until stiff. Add 2/3 cup of sugar very gradually and beat until stiff. Stir in 1 cup chocolate chips and 1 cup chopped nuts (nuts optional). Drop by teaspoonful on a foil covered UNGREASED cookie sheet. Place in preheated oven, close the door and TURN OFF OVEN. Leave in oven all night. DO NOT OPEN DOOR until the next morning. Makes about 35-40 cookies (number of cookies depends on how big you make them).